Mead is a fermented alcoholic beverage made of honey, water, and yeast. 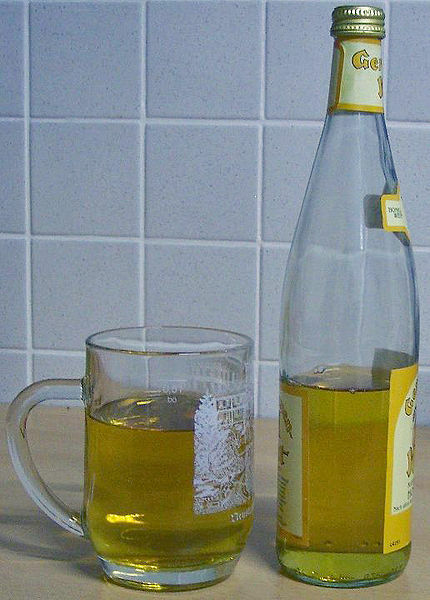 It is sometimes known as "honey wine". Mead is independently multicultural. It is known from many sources of ancient history throughout Europe, Africa and Asia. Its origins are lost in prehistory; it can be regarded as the ancestor of all fermented drinks. Mead can have a wide range of flavors, depending on the source of the honey, additives including fruit and spices, the yeast employed during fermentation, and aging procedure. Mead can be difficult to find commercially, though some producers have been successful marketing it. Many meads retain some measure of the sweetness of the original honey, and some can even be considered as dessert wines. Drier meads are also available, and some producers offer sparkling meads, which (like champagne) can make for a delightful celebratory toast. A mead may contain spices (like cloves, cinnamon or nutmeg) or herbs (such as oregano or even lavender or chamomile). A mead can also contain fruit (such as strawberry, blackcurrant or even rose-hips) and is used as a delicious way to store summer produce for the winter. Mulled mead is a popular winter holiday drink, where mead is flavoured with spices and warmed, traditionally by having a hot poker plunged into it. Left: Fermenter with airlock fitted. Mead is made in a fermentation vessel, preferably a glass carboy, with an airlock and a rubber bung. These items can usually be found at a brewer's supply store. Mead should be made in sanitized equipment to ensure food safety. The ingredients of mead are honey, filtered water, and yeast. Fruit or spices are optional. 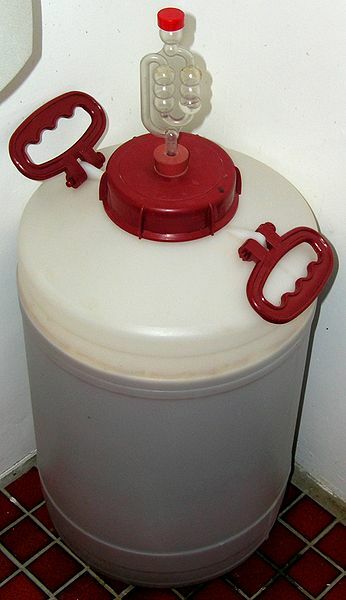 Some mead makers prefer to create a starter culture by preparing a mixture of one cup of room temperature sanitized fruit juice and the freeze dried winemaking yeast and placing it into a smaller one quart sanitized container fitted with a rubber stopper and airlock for a day or two until the mixture is bubbling. This container is kept at room temperature out of direct sunlight. This starter culture will cause the fermentation below to begin with vigor and may prevent the mead from failing to ferment. Honey is slowly added to a large pot half-full with water while heating. There is a common disagreement among mead makers as to whether you should boil the honey or not; mead makers have had success with either method. Boiling will alter the flavor, but will enhance the clarity of the finished mead. As the mead is heated over medium heat, it will nearly boil after the honey has been completely dissolved. After a time of heating the honey (which helps it dissolve and can also pasteurize it), the mixture is cooled to between (170°F/76°C) and (140°F/60°C) and the raisins are added. The mixture continues to cool, then is transferred to the carboy. Once it has cooled to room temperature (68°F/20°C), yeast which has been rehydrated is added to the honey/water mixture (must) and the airlock is put on. After being placed in a cool (68°F/20°C), dark place for a few hours or a day, the airlock should start to allow bubbles to escape. This is waste carbon dioxide (CO2) and shows that the yeast is processing the sugar into alcohol. The raisins rise to the surface of the fermenting mixture. If they block the airlock, the mead maker will have to rack. Stirring or agitating the mixture is avoided, as it may cause the liquid to rise up and spill out of the airlock. After a four to six week period the mead maker may want to rack the mead into a second sanitized carboy. An airlock is not necessary during primary (aerobic) fermentation. This racking will clear out the lees and allow the mead to clear faster. The mead is siphoned into the second carboy via a sanitized tube, usually filled with sterile water to start the siphon. The mead is siphoned carefully to avoid splashing as excess oxygen at this point may cause an unpleasant taste in the final product. An airlock is placed on the second carboy. It is imperative that sterile conditions be maintained while the carboys are open to avoid infection. The mead is racked in another 3 months or when all signs of fermentation have stopped (usually when the airlock doesn't produce any bubbles for a long period of time—typically over 30 seconds between bubbles) and your mead has cleared. Excessive racking will promote oxidation, resulting in an undrinkable mead. The carboy is clear enough when it is possible to read a newspaper through it. The mead will then need to age, usually one year, and anywhere up five or more. Bulk aging can be done in a tertiary carboy, but bottle aging is also common. Then next step is to bottle the mead. Mead is generally sealed in sanitized bottles using airtight caps or quality corks. If the fermentation is not complete, pressure will build up inside the sealed bottles and cause them to explode. Mead is generally aged for at least 6 months in the bottle before drinking.